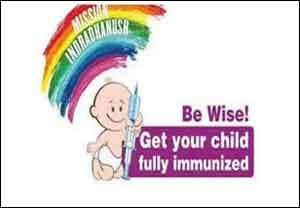 Chandigarh: The Intensified Mission Indradhanush (IMI) immunisation programme will be launched from October 7 in four districts of Haryana, the state government said on 17th September. This was announced in an official release regarding the the state task force meeting for the upcoming IMI round held under the chairmanship of Principal Secretary, Health, Amit Jha. Jha said the Central government had launched a nationwide intensified routine immunisation drive to close the immunisation gap. Wider publicity is a key strategy to generate awareness among the public and for raising demand of immunisation services under IMI, he said. The mission will help communities, parents and key stakeholders understand the importance of routine immunisation in protecting children from life-threatening childhood diseases, increase their confidence in vaccines, address their misconceptions and fears, and motivate them to seek immunisation services. It will help in reaching the unreached with key routine immunisation messages and collaborative implementation of communication aimed at achieving 90 per cent immunisation coverage, he said. Jha said IMI was the flagship initiative of the Central Government to increase immunisation coverage by vaccinating all unvaccinated and partially-vaccinated children aged up to two years, and pregnant women as per routine immunisation schedule.